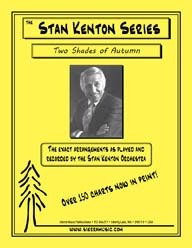 This wonderful ballad is recorded on the Stan Kenton Orchestra “Sketches On Standards" CD. This wonderful, medium-tempo, swinging version of this great classic is recorded on the Stan Kenton Orchestra "Sketches On Standards" CD. This is a beautiful ballad, exactly as recorded on the Rendezvous with Kenton album. Joe Coccia added a lot of wonderful music to the Stan Kenton Library.